1. The Rand Merchant Bank has contracted Delta Environmental Centre to conduct research to inform where Delta should position itself in the future. We are exploring three areas : a) skills for the “Green Economy”; b) looking at FET colleges & c) exploring the occupational qualifications framework. This research should help us find our niche for training purposes. 2. We have been contracted by the Ekurhuleni Metro to develop a species list and information boards for the OR Tambo Environmental Education Centre, at Leeupan, Wattville and the Kwanele Regional Park in Katlehong. 3. 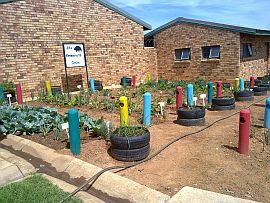 SASOL “Green Cage” project in Secunda – a recycling and waste management project for 20 selected schools in the Secunda area. DEC has been responsible for the past 3 years in offereing a workshop for participating schools, focussed on on-site school visits to provide support and encouragement to the “lead” teacher (and colleagues/learners), evaluating the submitted annual portfolios and awarding the allocated Prize Money. SASOL Ltd. Secunda has provided the funds for the whole project, including the supply of 4 wheelie bins per school to assist with the collection/sorting of recyclables. As this project has been running for the past 15 years, SASOL Ltd. Secunda staff are in the process of re-strategising and re-conceptualising their “environmental” community-based projects. Click here for further information/illustration about these training programmes.